This wasn’t originally going to be about views from hills on Tenerife, it was meant to be about rooms with a view, inspired by the vista from our balcony at the Barceló Santiago in Puerto Santiago. 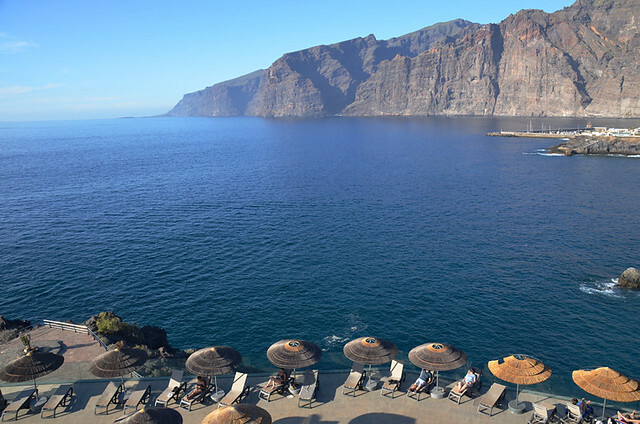 As I wallowed in a golden sunset which lit up the Los Gigantes acantilados I started pondering other Tenerife hotels with outstanding views. 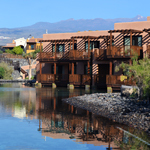 The Parador stood out, and looking inland on a clear day from the Hotel Botanico in Puerto de la Cruz is also quite special. But after those, another couple of 5 stars and some rural hotels, I struggled to think of ones with exceptional views. One of the problems is most look out over urban jungles or are just sea views. Don’t get me wrong, I’m hypnotised by sea views. I love to sit sipping a glass of vino with the sparkling water reflected in my eyes. But sunny sea views are sunny sea views. Unless there’s something out there to set them apart (e.g. La Gomera on the horizon) they don’t change much. As for urban scenes, most Tenerife hotels are in the midst of what are relatively recent developments, subsequently they don’t really possess the same sort of charm as, say, standing on your balcony looking across beguiling Florentine rooftops, apart from maybe in La Orotava, Garachico and La Laguna. 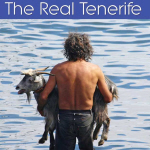 The natural side of Tenerife on the other had can hold its own with any number of destinations. The diverse landscape means you get a wide range of contrasting views within a small geographical area. There aren’t many specific locations within Europe which can compete with that. So, instead of Tenerife rooms with a view, here are ten of my favourite hillsides with a view. I could pick any number of spots from which to gaze in awe over the sprawling plains, volcanic fields and twisted rock formations of Teide National Park, but this saddle where you can enter the park on foot from the north is one which doesn’t feature in as many photos as southern slopes. For that reason it’s more satisfyingly surprising to stand beside the little shrine at the degollada to soak up a different view of Mount Teide and the park. You can drive to the Mirador de la Centinela near San Miguel de Abona, or you can do what we do and walk there. I appreciate not everyone is able to negotiate the steep slope leading to the restaurant and viewpoint, but it does add more of a feeling of achievement if you can, making the views all the more enjoyable having worked hard to get to see them. 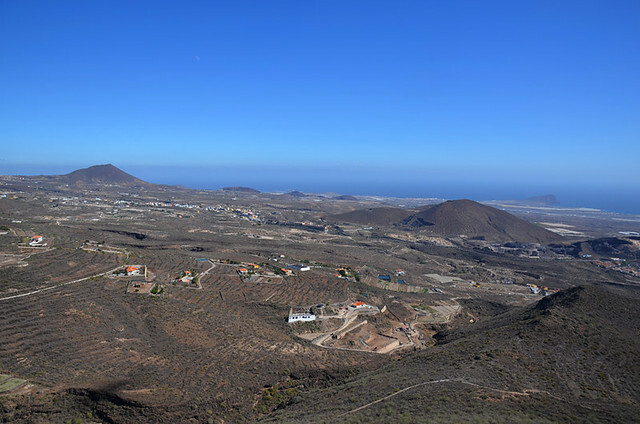 It might not be as pretty as some other parts of Tenerife, but looking east from the mirador reveals a fascinating landscape pockmarked by volcanic cones. There is a viewpoint at Baracán you can drive to. But the view, although good, is nowhere near as stop-you-in-your-tracks impressive as the one on the ridge leading from the peak of Baracán itself. 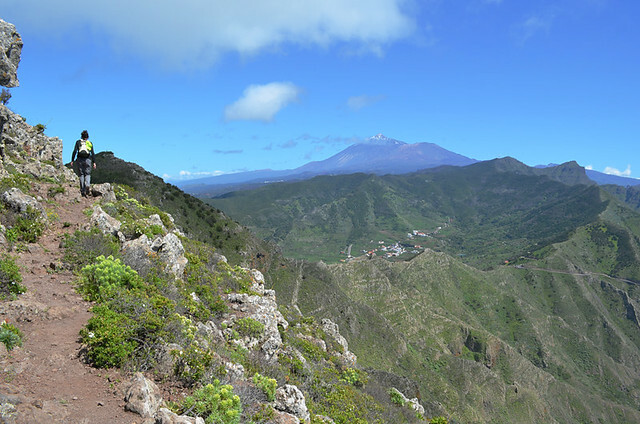 It is simply one of our favourite views on Tenerife – it’s a thrilling spot to just stand and take in the scenery, whilst wondering what happened to the path ahead which seems to disappear into a knife-blade of a ridge. 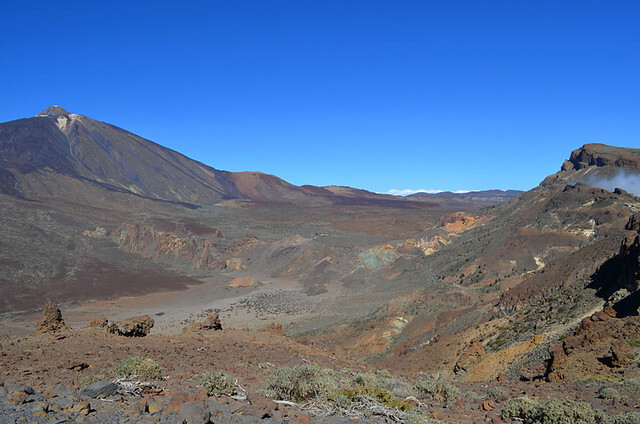 The wondrous world inside the crater at Teide National Park tends to hog all the attention; however, move away from the roads dissecting this vast volcanic landscape and there are different yet equally stunning surreal scenes to be enjoyed. The area around La Tarta to the east of the park isn’t exactly a Tenerife secret but you don’t see as many photos of it in travel articles or on social media. Thousands of people will be familiar with this one, even if they’ve never actually stood at this point themselves. 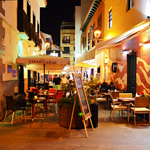 It’s the image used on the cover of guidebooks and in numerous travel articles about Tenerife whether they actually mention this part of Tenerife or not. 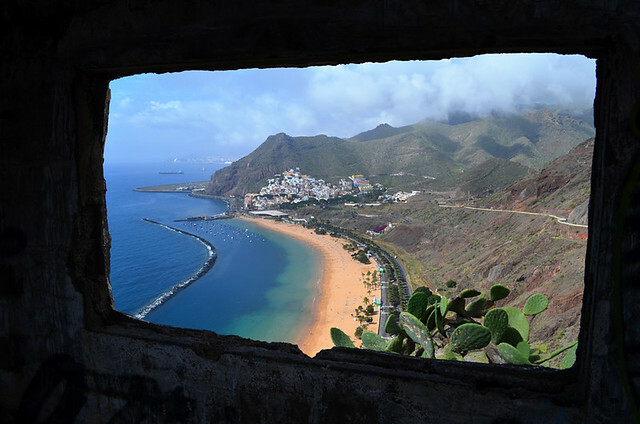 The view over Playa de las Teresitas is a classic Tenerife shot. So, just to be different, here it is through the window of one of the abandoned buildings on the hill overlooking the beach. 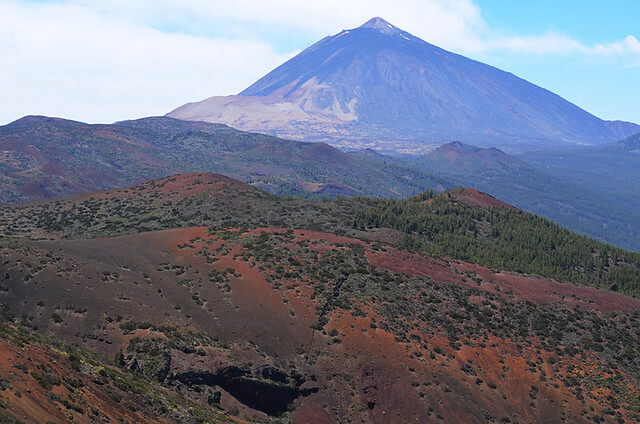 Montaña de los Frailes is one of three volcanic cones which once lay in a line across the lower Orotava Valley, one was flattened when Puerto de la Cruz was being developed for tourism. Most people will know Montaña de los Frailes because of the restaurant complex of El Monasterio which clings to the lower slope. 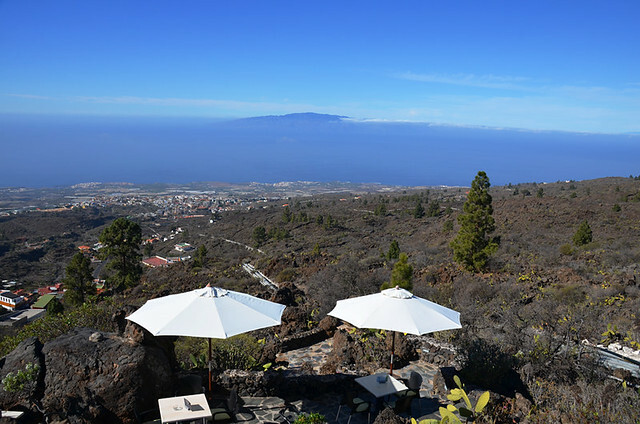 A path climbs from the gardens at El Monasterio to the small ermita at the summit of the cone where you can spin slowly to revel in the 360 degree views of the Orotava Valley. Thanks to the near constant wind which attracts windsurfers and kite-boarders to the area, it can be a breezy old climb to reach the summit of a mini mountain which is one of the first sights many visitors to Tenerife see as their planes touch down at Tenerife Sur Airport. But it’s worth the effort to stand above the south’s best looking natural beaches and look down on the planes taking off at the nearby airport. 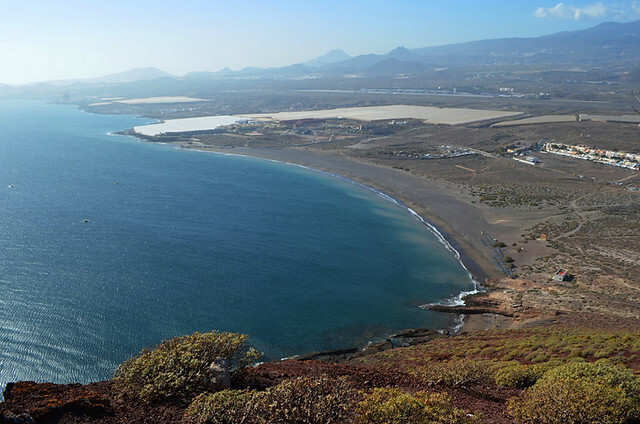 Again, although most people drive to the Mirador de Chirche, it’s far more satisfying to walk there from Guia de Isora. 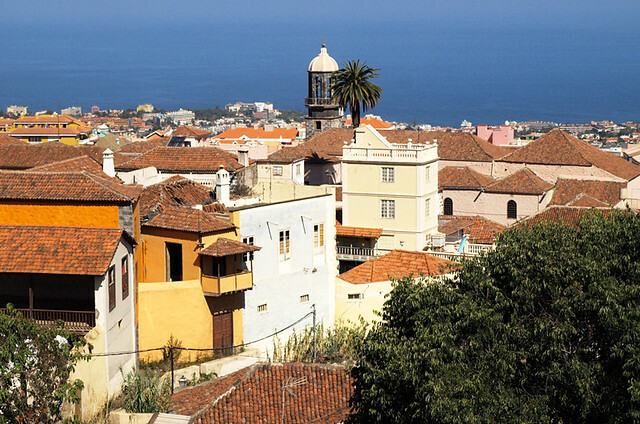 The obvious pay off is the view from the mirador roof of the cafe, but that doesn’t really put into context the surrounding landscape with its glimpses into what life was like in the past in this part of the south west of Tenerife. 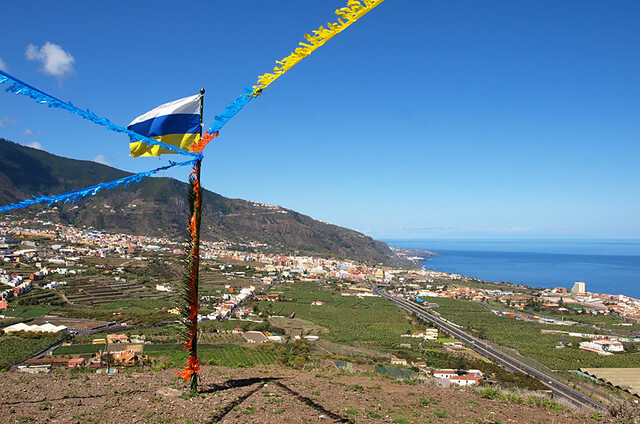 Walking to Mirador de Chirche adds an extra layer of depth to the views across the south west to La Gomera, La Palma and sometimes even El Hierro. Another of the island’s real knockout moments is to be found by climbing through the forest from remote Chamorga, at the very end of the road though Anaga, to emerge on the edge of a sheer cliff- face where there are quite incredible views along the wild and rugged north coast. It’s one of those places where you feel more like you could be on an adventurer in an exotic land than hiking on an island visited by millions each year. A word of warning though, often this part of the forest is shrouded in low cloud so it’s not a scene which is guaranteed. 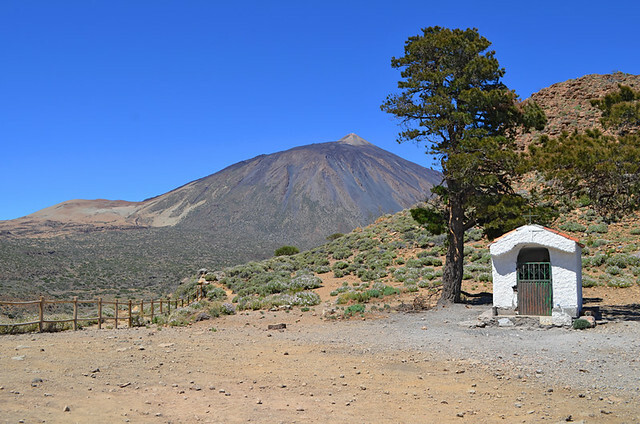 Instead of going for the obvious and picking a spot on Mount Teide itself, to balance out having a hillside with views of Teide National Park from the north of Tenerife, I’m including one from the south. Montaña Guajara might seem the obvious choice for a hearty dose of volcanic views but I’m opting for a spot a bit further south along the top of the crater wall. That way I get both Guajara and Mount Teide in the viewfinder. 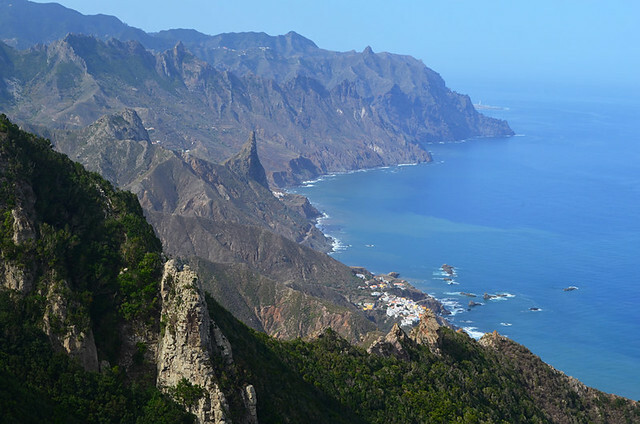 Many of the viewpoints mentioned are included in our Real Tenerife Island Drives or on our Real Tenerife Island Walks. 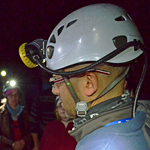 No mention of Humboldt Mirador? Does that mean it’s still closed? The fiasco surrounding Humboldt’s Mirador continues with no end in sight. It’s still closed but there are plans for that area. The big question is how long it will take to move from ‘plans’ to reality. Still a great view though.